Mighty Media Kids, 9781938063039, 32pp. Flippity flop and splash your way through this colorful trip to the lake. Jump in with your senses and play with rhymes as you experience the waves, the boats, and the many animals. This cheery book follows three children as they enjoy the simple pleasures and rare glimpses that nature offers us around the lake. 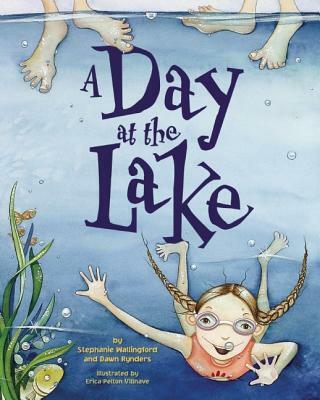 A Day at the Lake is told using all five senses, and teaches children vowels and sound effects. Contemporary, large, and brightly colored illustrations bring this story to life. Simple, short text leaves much to the reader's imagination as they experience their own day at the lake. Stephanie Wallingford was born in Anchorage, Alaska, in 1974 and lived in Maryland and Kansas before heading north to settle in Minneapolis, MN. Inspired by a family full of creativity and humor, Wallingford grew up writing poems, singing, playing the piano, and making messes with art supplies and scotch tape. Wallingford first majored in English and completed her coursework with a degree in Business Administration. Wallingford lives in picturesque Minnetonka, Minnesota, with the love of her life and has three children, Allegra, Anissa and Aidan. Through years of reading with them and making up her own bedtime stories and songs, she began to write children's manuscripts. "A Day at the Lake" is her first published work. In addition to writing, she enjoys trend spotting and reading about fashion, nutrition, technology and business and is an avid yoga practitioner and enthusiast. Dawn Rynders has been a children's literature enthusiast for most of her life. First, reading books as a child, next as a student studying them, then as a parent spending hours reading to her children, and finally as an author writing children's literature. Dawn's quaint childhood was filled with tagging along after her parents on the farm, riding her elderly Shetland pony, Trigger, and well-loved afternoons at the lake with her grandmother--all great subject matters for her writing. After receiving her BA in creative writing at Dordt College, Sioux Center, IA, Dawn moved to Minneapolis, MN. There, tucked between the shores of Lake Minnewashta and Lake Minnetonka, she and her husband Eric raise and enjoy their three children, Henry, Beatrice, and Simon. Erica Pelton Villnave's involvement in children's literature began at The Maryland Institute College of Art where she studied illustration. She loved the idea of using her artwork as a form of communication and to promote literacy among children. There are certain books that children cherish for a lifetime. As an illustrator, Erica is interested in creating picture books that will attract such interest and inspiration. Erica shares her home in upstate New York with her husband, her one year old son, two cats and two very large dogs. When she isn't working on an illustration Erica enjoys working on other craft projects like painting furniture and sewing. She also loves exploring the outdoors, gardening and taking long road trips to places she has never been before.